I enjoy lit fests. But, only up to a point. Being a lit fest veteran, I have to admit, I am kind of jaded and done with the circus. Someone needs to reinvent the format before the next season is upon us. There are lit fests and lit fests, of course. Every city in India seems to host one or two or five these days. They have replaced fashion weeks in some metros. Pretty much the same set of people show up in carefully curated designer gear, handpicked to match the tone of each event. I have started enjoying the side shows far more than some of the ponderous, studiedly intellectual discourses. Then, there are the lit pests to deal with—random folks who have never held a book in their hands, but demand selfies. As for me, I create my own entertainment at every venue. And, manage to have a jolly wonderful time. Take the recently concluded Kerala Literature Festival, billed as “the second largest in Asia”. It has its own charm and attraction, since the venues for the sessions are on the beach. I would believe the KLF boast, after seeing the numbers at my session on a Sunday evening crowded with competing events. I am sure half the crowd was there to see the lovely and well-spoken actress Padmapriya, who was in conversation with me. I was captivated by her, myself! She was the gorgeous surprise number one. Then came my visit to CVN Kalari, a kalaripayat institution run ably by Vijayan Gurukkal and his charming son. I was prepared to attend a training session just to understand what it takes to become an accomplished kalari practitioner. My daughter and I found out soon enough, when we were escorted into a large, airy arena with a sand floor. The place exuded an overwhelming testosterone vibe. One by one, the ‘warriors’ walked in, reverentially bowing to their bearded, grey haired guruji, after paying obeisance to the images of various deities, as also to a pyramid of weaponry. I watched their warm-up exercises, and was astonished by their agility, given that the men were pretty chunky, and not whippet like. Despite their girth, they were remarkably light on their feet. Discovery of the morning: Nothing was faked. This was the real thing. The gleaming daggers in their hands were killing instruments. Their spears could pierce a rhino (okay, a buffalo), and those lethal looking double-edged, flexible swords (urumi), were just that—lethal. But, what took my breath away was a demonstration of the technique called Kathiyum Thalayum [Knife and Cloth], which has a person defending a knife attack, armed with nothing more dangerous than a length of fabric, held in both hands. Never has six feet of fine muslin looked as scary! This manoeuvre has to be witnessed to be believed. It establishes the practitioner’s total mastery over his body and mind. If, in a real situation, such a person loses focus for even a microsecond and misses crucial eye contact with the antagonist, he is dead. Simple. It is this perfect coordination over muscles and mind that make this martial art so magnificent. I found the experience absorbing and thrilling on several levels. 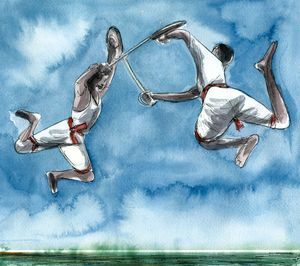 I am told modern day karate and kung-fu owe a lot to kalari. Look at the way those two martial art forms have been aggressively marketed across Southeast Asia and beyond. God’s Own Country has one more ‘exportable’ treasure. We should be sending our best exponents abroad to show the world where it all started. After getting back to my far more mundane life in Mumbai, I watched the videos we had shot, and marvelled at the skill of the men in that arena. Each one had ably demonstrated what it requires to get there—guts, discipline and commitment of the highest order. We should all learn from this ancient martial art and find the kalaripayat spirit within.